HONOLULU -- Ten Oahu families were awarded free solar water heater systems today after they won a drawing sponsored by Blue Planet and Suntech Hawaii. The families were randomly selected from a list of people who signed up to be a “friend” of Blue Planet Foundation, a nonprofit created to change the world's energy culture by raising global awareness and developing practical programs to implement clean, efficient and renewable energy. Suntech Hawaii, founded in 2004, is a renewable energy company specializing in solar photovoltaic and hot water systems. The 10 solar water heaters—to be installed in the first months of 2009—will save approximately 500 barrels of oil over the life of the system. At today’s electricity prices, they will also save the homeowners about $150,000 collectively over the next 15 years, a spokesman said. 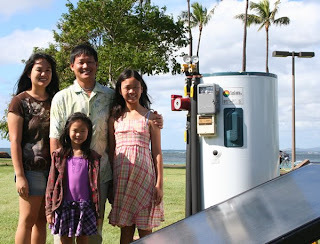 Blue Planet and Suntech Hawaii are able to deliver solar hot water systems system at no out-of-pocket cost to the homeowners because of the state and federal tax incentives supporting adoption of solar energy. The two organizations have agreed to jointly cover the full after-tax/after-rebate cost of the systems.